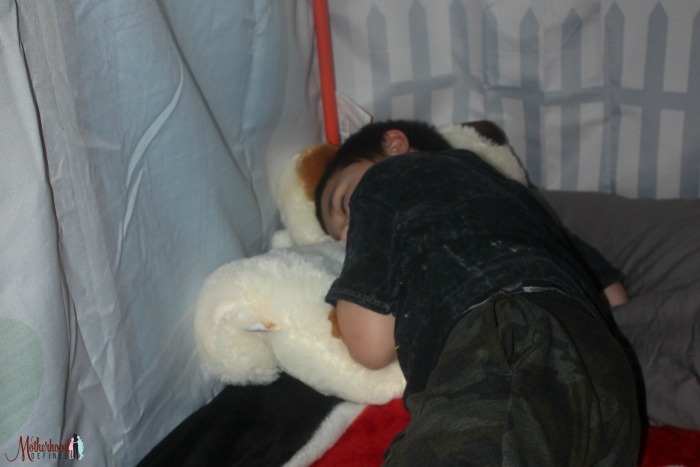 I am always on the lookout for pretend play products that are available for my children as they age. Even at 7 and 11, both of my boys still love to play house, cook and open imaginary stores. Sadly though most products out there are created for toddlers and shorter youth. 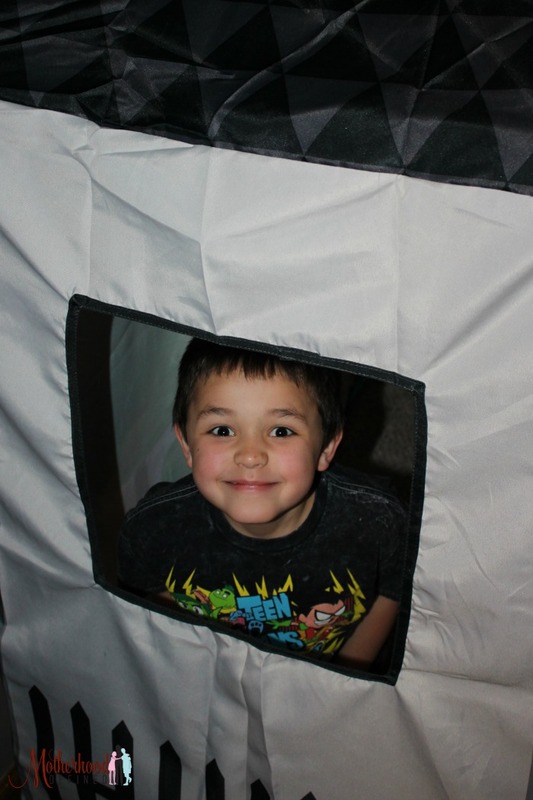 So to our joyous surprise, Antsy Pants offers a medium Build and Play Kit that once fully built with play house cover creates a unit that stands 72.4 inches high. 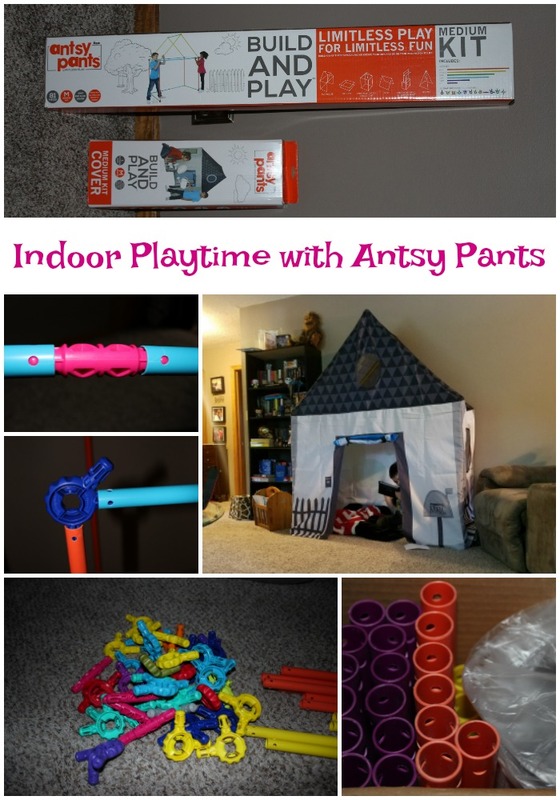 We started our indoor play project with the Antsy Pants Medium Build & Play Kit ($49.99 at Target) and Play House Fabric Cover ($24.99 at Target). These can be put together to create a variety of medium projects including the playhouse, circus tent and fairy tale castle. For smaller projects, the same kit can be used along side of the small covers including a lemonade stand, farmer’s market, tent and so much more. The Build & Play kit comes with instructions on builds for all of the available projects for it’s kit size. 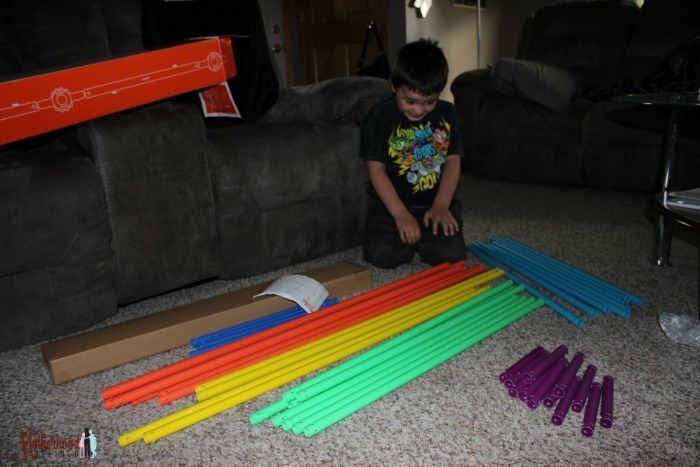 At 81 pieces which includes easy-to-assemble Snap and ClickTM connectors and poles, all of which are color coded to make the build simple enough even a child can complete it. The pole frame is PVC, sturdy and strong for safety. All connectors are created from plastic and while that might sound not so appealing, it’s the opposite. They are thick and very well crafted. In fact, I was pleasantly surprised in how well everything snapped together with ease without the need of tools. Yes, that’s right; Antsy Pants products are tool-free, battery-free builds. Plus, plus! From one mom to another, the wipe clean with a damp cloth feature is like a breath of fresh air. 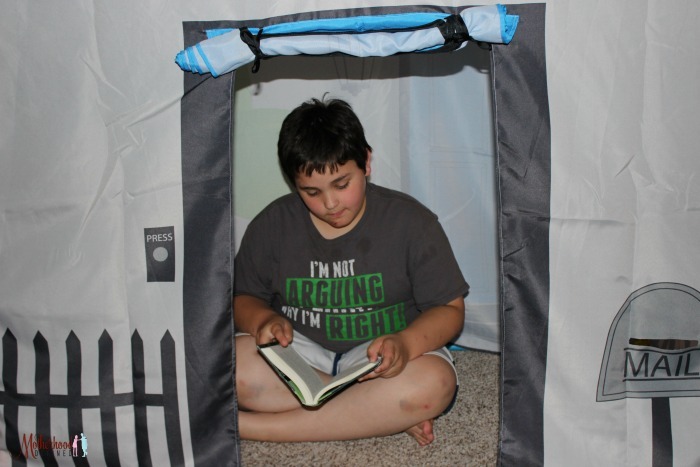 Especially since my boys like using the playhouse as a reading or tablet time area where snacks and drinks are welcome. Not to mention the lack of a floor and light-weight structure make it simple to move when needed to vacuum the floor below. The Antsy Pants Play House design leaves nothing out. You can find a roll-up door with window, two side windows for greeting those that pass-by or to play peek-a-boo with the kitty (our favorite), fancy circle faux window at the top, book build, fence and even a mailbox for playtime deliveries. This is perfect for children who love to dream, build and explore, fostering their larger than life imagination. 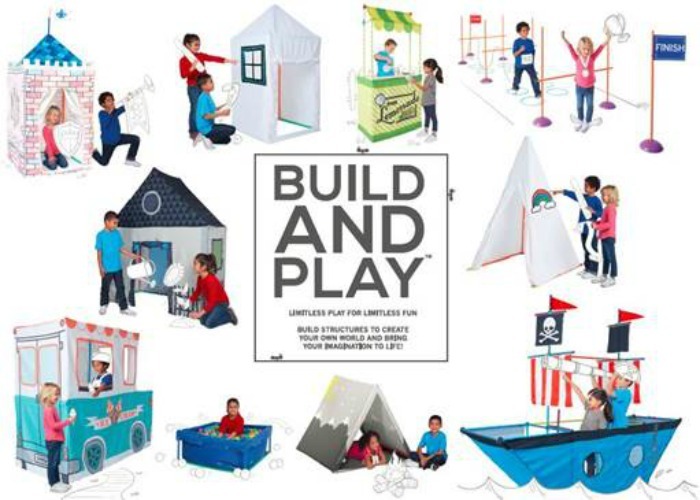 Kids are given the independence to build each kit all on their own, allowing children to design their own playtime while encouraging movement and creativity. About Antsy Pants – The idea for Antsy Pants came to life through a collaboration built around the desire to take playtime back in a world dominated by screens by getting kids and families creating, imagining and building together. Through its availability at Target, Antsy Pants will also help support KaBOOM!, a national non-profit dedicated to ensuring that all kids get a childhood filled with the balance and active play they need to thrive. Antsy Pants will make a donation to KaBOOM! for each product purchased, and is projected to give more than $150,000 in the first year to build playgrounds for kids across America. Antsy Pants Build and Play Kits come in three sizes, with a variety of imaginative corresponding fabric covers including: The Lemonade Stand, Farmers’ Market and Pirate Ship, along with DIY covers that allow children to design their own play. The line, which starts at $14.99, also includes play balls, an obstacle course, a 4-in-1 play liner and a storage unit for limitless fun. Antsy Pants aims to change the way kids everywhere play for the better to promote originality, exploration and activity. By getting kids and families creating, imagining and building together again, Antsy Pants is bringing back imaginative playtime! 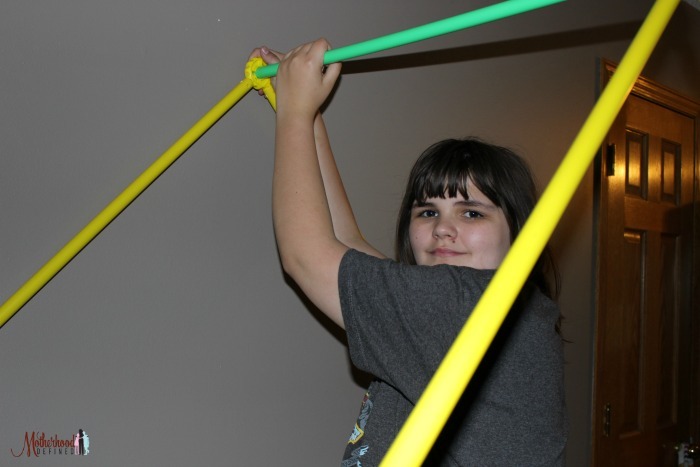 The play structure’s limitless possibilities are encouraging active bodies and inspired minds. For more information, visit www.antsypants.com.